Happy Children’s Dental Health Awareness Month! Home / News / Community / Happy Children’s Dental Health Awareness Month! 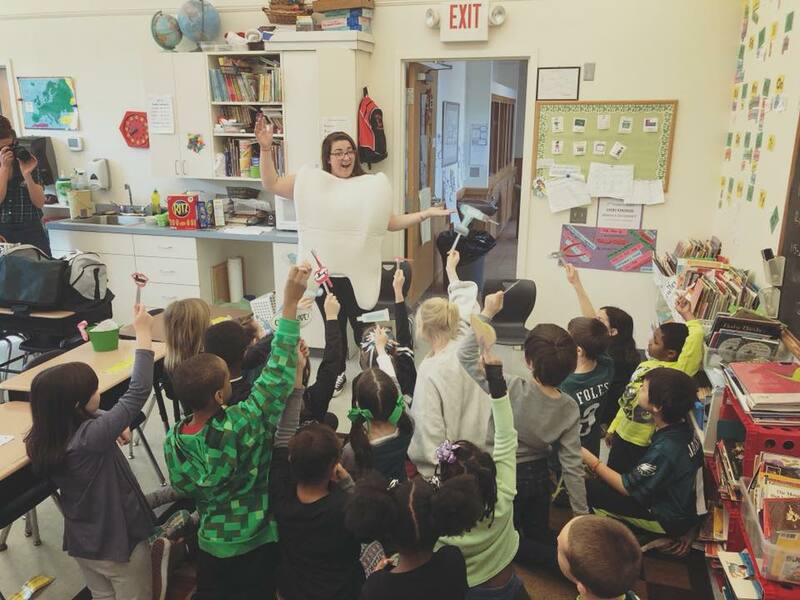 Ashley dressed up as a molar for our Children’s Dental Health Month presentation. February is Children’s Dental Health Awareness Month, and we are loving the celebration! Dr. Alrez & Ashley traveled to a local elementary school to give a presentation about dental health. Ashley even dressed up in a molar costume! Since it is Children’s Dental Health Month, the time is right for celebration. It’s also a good time to check in with your family and make sure you’re doing everything you can to keep your children’s teeth healthy as they grow. And it doesn’t need to be a chore! With the right mindset and technique, teaching your kids about oral hygiene can be a lot of fun. Not sure where to begin? Try starting with our list of five ways to get your kids excited about dental hygiene! Lead by Example: Before you encourage your children to have good oral hygiene, check your own habits! Make sure your kids see you brush every morning and night and floss daily. Don’t forget to talk about how much fun it is and how much you love to take care of your teeth! Fun Supplies: Allow children to choose a toothbrush with their favorite cartoon character and fun cup for rinsing. Toothpaste flavors like watermelon or strawberry are also fun to have on hand. Sing Along: Find fun oral health songs to sing with your kids. Here is a playlist to get you started. Teeth Activities: Create fun, hands-on crafts with your kids to help them learn about oral health. Check out these activities. Offer a Reward: Create a chart for keeping track of your child’s brushing habits, marking each day with a cute sticker. After 7 days of brushing, your child gets a reward! Since you are pushing oral health, try to refrain from giving sweet treats as rewards. Some other ideas include choosing a movie to watch as a family, a playdate with friends, a trip to the park, or a certificate.